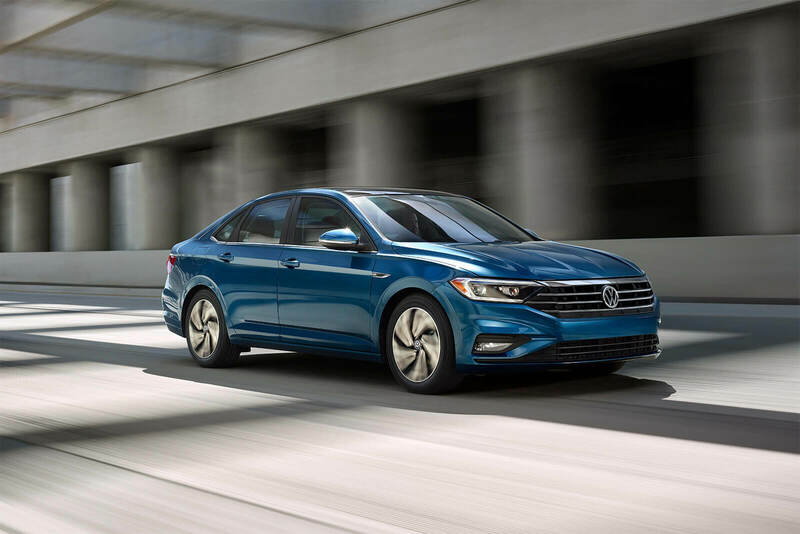 Come See the 2019 VW Jetta Before it Launches! Two-tone V-Tex leatherette seatsComfort, say hi to style. These available two-tone seats feel like leather and look great, thanks to Titan Black bolsters and perforated Storm Gray inserts. Available Adaptive Cruise Control (ACC) helps the vehicle maintain a preset speed and distance from the car in front of you. When activated, if the car in front of you speeds up or slows down, the sensors can detect the change and your car follows suit. When driving, if you attempt to change lanes, the available Blind Spot Monitor can help alert you to cars that may be in your blind spot. The Active Blind Spot Monitor (available when vehicle is equipped with Lane Assist) on select models can also counter-steer within the limits of Lane Assist to help keep you in your lane if you attempt to change lanes when a vehicle is in your blind spot. In addition to the visual warning in the side mirrors, the steering wheel can vibrate. When moving, the available Lane Keeping System (Lane Assist) can sense if you start to drift into another lane without using the turn signal. Within the limits of the system, Lane Assist can help steer to help keep you in the current lane. The available Forward Collision Warning (included in Front Assist) system has a radar sensor in the front to help monitor traffic and can alert you acoustically and visually to a potential front-end collision with the vehicle moving ahead. If it senses that a collision is imminent, Autonomous Emergency Braking (included in Front Assist) can support the driver with increased brake pressure or, if the driver does not react at all, it can apply the brakes automatically. Turbocharged engineIn the small sedan world, great performance can require an upgrade. Not in the Jetta. Turbocharged exhilaration comes standard.